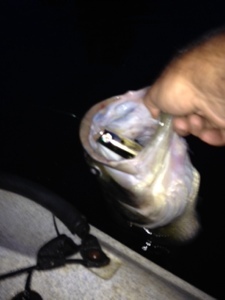 Extreme Topwater: Black At Night? Maybe Not! 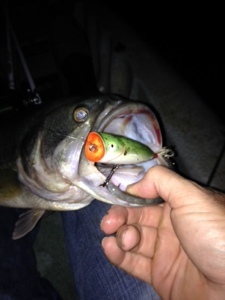 I'll be the first to admit I use black topwaters at pre-dawn.I'll also admit that a black lure held up to the night sky is easier to see,well I guess..let's hold a chartreuse popper up against the night sky...well it looks...about the same.What's all this funny business? Well,after doing a good deal of bassin' in the dark,I figured let's just spend some time throwing chromes,yellows,and just regular daytime colors we all use during sunlight periods. 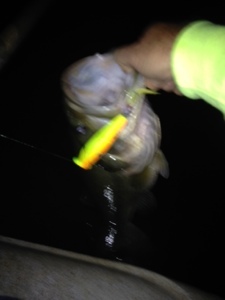 I mentioned when bassin' in the dark. and unanimously all the other colors beat black.What does this mean? Well it tells me that presentation is key over color.For me,I feel most topwater baits that cause some type of disturbance on the surface will get the job done. Your results may vary,but don't be hesitant about throwing that white Zara Spook into the night sky.Just make sure you have a good quality feathered treble on the back( regardless of color) and you'll be in good shape. You hit the nail on the head with this one Mark. I'm with ya about the colors on surface, but under the surface it can be different. 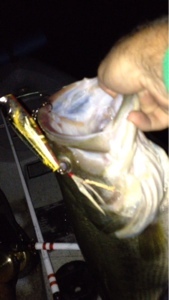 I've done a lot of night fishing, and the dark purples, reds, blues, blacks, black chrome,,,well, you get what i'm saying. Cool write you done on the subject, was very pleased with reading. Fishing this moon while I can, I'm outta here and headed to the water. 8:01 PM 08-03-2015 Com-on moon, get over thosee trees.